Summer's Just Begun, But The Southwestern U.S. Is Already Baking : The Two-Way Parts of California, Nevada and Arizona are under excessive heat warnings through Sunday night. 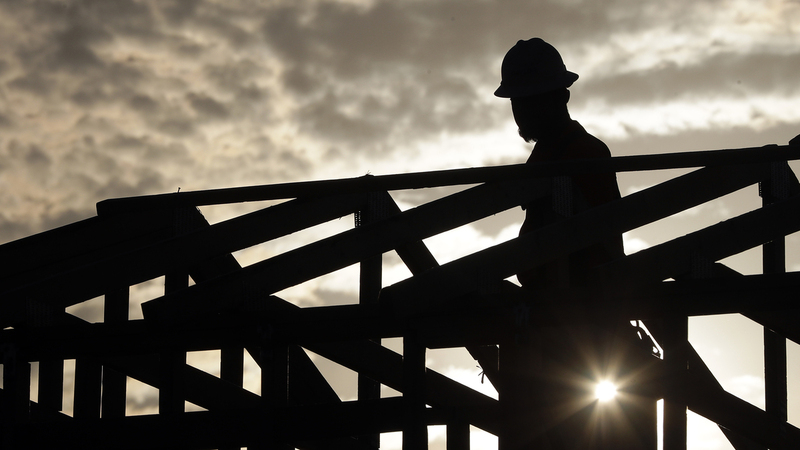 A construction worker climbs onto a roof at sunrise Tuesday to avoid the heat in Phoenix. The temperature there reached 119 degrees, as the Southwest bakes in a heat wave. Summer officially began at 12:24 a.m. ET Wednesday, but as the Southwestern United States bakes in a heat wave, the season may already feel like a long and sweltering slog there. The mercury hit 119 degrees Fahrenheit in Phoenix on Tuesday, 117 in Las Vegas and 121 degrees in Palm Springs, Calif.
And while forecasters say the heat was expected to peak on Tuesday, excessive heat warnings remain in effect through Sunday evening in parts of Arizona, Nevada and California. The National Weather Service is telling residents to take the heat seriously, with a somber warning on its website: "If you don't take precautions immediately when conditions are extreme, you may become seriously ill or even die." 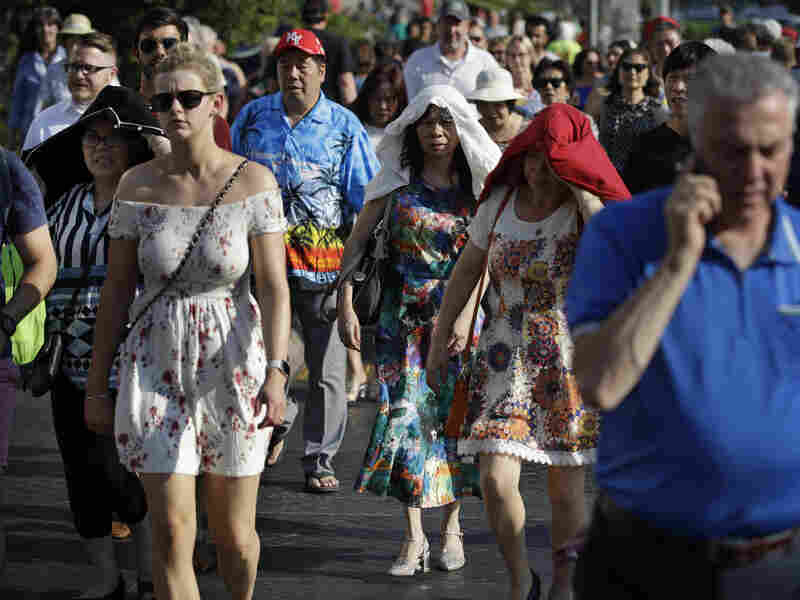 People shield themselves from the sun Tuesday while walking along the Las Vegas Strip. The mercury hit 117 degrees there. The advice is straightforward: Drink lots of water, limit outdoor activities and wear loose and light-colored clothing. Check in on the sick, elderly and those who don't have air conditioning. And never leave children or pets alone in a vehicle — no matter how briefly. In Tempe, Ariz., PetSmart offered some extra help to keep animals safe in the heat. The store gave away free booties to protect pets' paws from the sizzling cement, The Associated Press reports. Some of the highest temperatures in the Southwest are in Arizona. On Tuesday it was hot enough to ground some planes. And Wednesday's expected high of 117 degrees promises little relief. With heat like that, simply stepping outside can become a hazard. "It's not unheard of for the asphalt, the road, to get to 140, 160 degrees," National Weather Service meteorologist Paul Iniguez told NPR's Morning Edition. "That's hot enough that if you trip and fall, or something happens and you find yourself on the road, it can cause burns instantly, just from touching that." The homeless are especially vulnerable to the extreme heat. David Smith of Central Arizona Shelter Services tells Morning Edition his agency is handing out more blankets. "Obviously it's way too hot for a blanket," he says, "but for individuals who are sleeping on the streets, they put it down to prevent themselves from burning, to insulate themselves from the asphalt." And while 119-degree days in Phoenix are rare, they are not record breakers. Phoenix hit its record high of 122 degrees on June 26, 1990, according to The Arizona Republic. In Nevada, the Las Vegas Strip looked like a ghost town Tuesday. People who did venture out flocked around spray misters, even though the water evaporated fast, the Los Angeles Times reports. In parts of California, a red flag warning is in effect — the National Weather Service's highest alert for the risk of fire — through Thursday evening. Hot and dry air, combined with gusty winds, could allow a mere spark to quickly become a major wildfire. The California Department of Forestry and Fire Protection says extra firefighters are on duty, battling multiple blazes across the state in the past few days. And while the current heat wave may be the result of a high pressure system, scientists say it is also part of an overall global warming trend. A study published Monday in the journal Nature Climate Change finds that "around 30% of the world's population is currently exposed to climatic conditions exceeding (a) deadly threshold for at least 20 days a year." Forecasters say the current heat wave should break by early next week, returning Phoenix to more typical summer temperatures — around 110 degrees.